Dozens of islands within the Caribbean have led the transition to Solar Airfield Lighting over the past decade. Currently there are solar LED airfield lighting systems in The Bahamas, Dominica, Barbados and Antigua, to name a few. This transition has benefited the airports in areas of operations, safety and finance. Caribbean islands face a unique challenge: they are very dependent on aviation, and electricity can be very expensive. The Bahamas, for example, is composed of hundreds of islands spread over a wide area. These ‘Family Islands’, as they are known, have dozens of airports to support the movements of goods and people around the country. Almost all aviation in the Bahamas is during the day, as airports historically had no lighting. This posed a major problem in the event of medical emergencies that necessitated evacuation to larger centers, as the MEDEVAC aircraft would attempt landing in some very precarious situations. Solar Series Wind Cones are being installed at a Waste Water Treatment Plan in Edmonton, Alberta Canada. In an effort to improve operational safety, the customer requested LED windsock lighting so the on-site personnel could be aware of wind direction and velocity. As a heavy industrial facility, the waste water treatment plant is required to monitor environmental conditions in order to keep pollutants away from employees and the community. Steve Thurston, Head of Planning and Development, Southampton Airport speaks about the major benefits and cost savings associated to using the Solar Series Elevated Runway Guard Lights (ERGL's) at Southampton Airport. Southampton Airport’s vision to become ‘Europe’s leading regional airport’ has provided the motivation for a number of innovate investments in recent years. With a couple of UK firsts amongst the developments, including being the first UK airport to have solar powered LED runway guard lighting, the regional airport with the big ideas is set to continue trend setting in 2012. Aviation Renewables has been issued a contract to deliver multiple units of its Solar Series LED Windcones and Windsocks for international and regional airport operations within the Caribbean. The Solar Series LED Wind Cones have been installed in multiple locations throughout the Caribbean, and continue to prove their reliability in this tough environment. With all-aluminum construction, the windcones do not rust in the humid salt-laden air, and have continued to improve safety of operations for both daytime and nighttime operations. Using high brightness LEDs and a rugged in house fabric, the internally lighted windsocks will be illuminated to support nighttime take off and landings. By installing the Solar Series LED Wind Cones, the airport benefits from significant up front capital and infrastructure costs along with the elimination of continuous maintenance and energy costs. As an off grid solution, the island airports further reduce their environmental footprint by going green. Manufactured with a patented swivel, LED obstruction light and a pole mounted solar power operating system, the internally lighted Wind Cone provides reliable, care free operation in the challenging equatorial conditions of the Caribbean. Aviation Renewables has recently returned from The Bahamas after delivering, installing and commissioning an extension to the runway lighting system after the paving was completed. Included in the work was the moving of the simple approach system, and mounting the lights on new frangible posts. With the runway extension, the airport can handle larger and faster aircraft to support clientele at a new hotel and resort. The installation of lights on the extension was completed in a few short days, highlighting the flexibility and ease-of-use of solar powered runway lighting. As a radio-controlled system using a 2.4Ghz Mesh network, the lights were able to quickly re-organize the network to include the additional lights, resulting in seamless operations for the airport. While on-site, Aviation Renewables did a diagnostic check on the original lighting installed in 2013, and all lights reported healthy batteries. The batteries have an expected lifespan of 5-7 years with normal use, so this finding was expected. The ICAO Simple Approach system was installed on frangible poles due to the grading in the approach area. Because of the lack of wiring and electricity required, the Simple Approach installation was completed in 4 hours, resulting in zero interruption to airport operations. 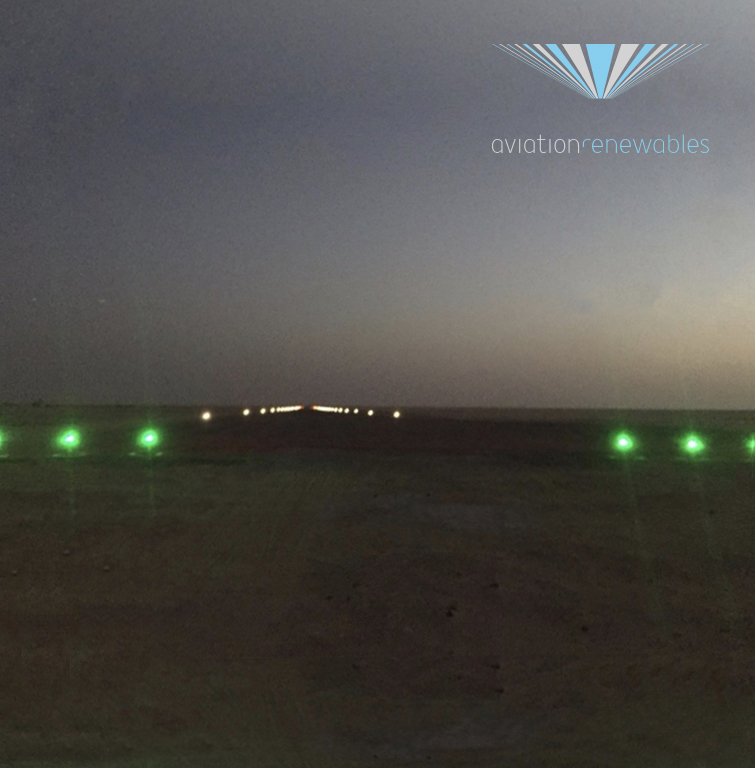 With over 30 Solar Series Solar Airfield Lighting systems installed worldwide, Aviation Renewables is the market leader for solar-powered PAPI systems; offering full design, installation, training, commissioning and support of each system.